This recipe for pan-fried trout uses simple ingredients—garlic, lemon juice, and a little butter—to let the subtle flavor of this delicious fish shine through. All the fillets need are buttery mashed potatoes and roasted cherry tomatoes for a stellar meal. Luckily, the two sides are included in this recipe, creating a perfect dinner for two. The recipe is a specialty of New Zealand, where people come from all over the world to fish for country's trout. This most prized freshwater fish, with its delicate pink flesh, swims the rivers and streams of both Australia and New Zealand, but New Zealand is the place where the trout are legendary. No matter where your trout comes from, you're going to love how this recipe dresses up the fish. 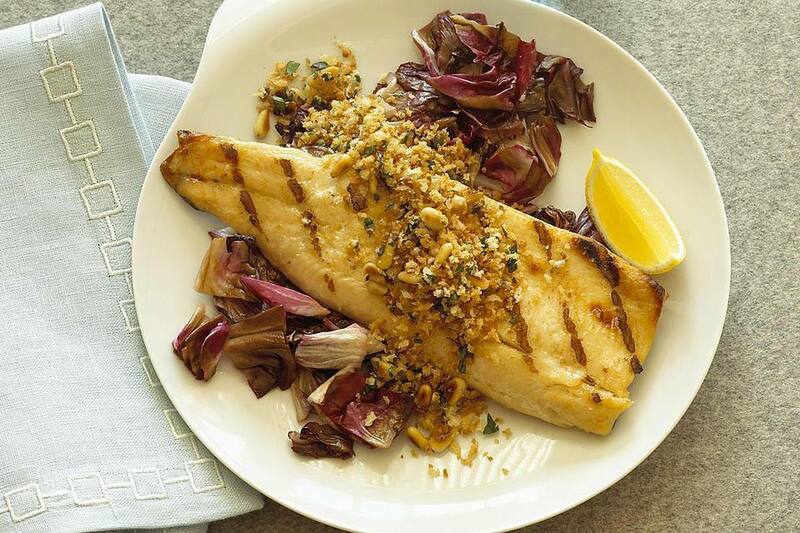 Note: while there are multiple steps to the recipe, this trout meal is broken down into workable categories to help you better plan for preparation and cooking. Wash and pat dry the cherry tomatoes. Place them in a small baking dish. Drizzle with olive oil and sprinkle on salt and pepper. Sprinkle on the lemon zest and then cover the dish with foil. Roast for 25 minutes, remove from the oven and set aside. Add the peeled and quartered yellow potatoes to a pot of cold water. Boil the potatoes until soft, about 20 minutes, then drain. In a large bowl, mash the potatoes well. Add the milk, butter, sea salt, and pepper. Combine well, cover, and set aside. Meanwhile, in a medium skillet, heat 1 tablespoon olive oil over medium heat. Add 2 cloves finely chopped garlic and sauté for 30 seconds. Fry the fish, skin side down, in the skillet for 5 minutes. Turn the fillets over and fry for 2 minutes. Turn them over—skin side down again—and turn off the heat. Squeeze 2 tablespoons lemon juice over the fillets and add 2 teaspoons butter. Sprinkle on 1 tablespoon finely chopped parsley. Adjust the seasonings with salt and pepper. Plate the fish with the sides of mashed potatoes and roasted tomatoes. Pay attention to the timing needed to cook each of the three elements so they're all done at about the same time. Start with the tomatoes, but get your potato water boiling right away, too. About 5 minutes before those are done, begin warming up your skillet. Keep both warm while you finish the trout. If you want to fire up the grill, you can make this meal with a couple adaptations. Either make the mashed potatoes in the house or grill the potatoes rather than mashing them. You can also skewer cherry tomatoes or grill large tomatoes directly on the grate. Bring more flavor to the trout by adding 1 teaspoon of onion powder and a few fresh sprigs of dill. A pinch of paprika is also a nice touch for trout.